MORGAN HILL – Standing before a tough crowd Sunday, Magical Wizard Lee Curtis had his work cut out for him. A group of skeptical seven and eight year olds anxiously were awaiting his next trick, trying to figure out his secrets. With each part of Curtis’ magic act, from making objects change places to card tricks to making his pet rabbit Crystal appear in a cage, he began to win over the kids at 8-year-old John Patrick’s birthday party. Well, all of them but one; no matter what trick Curtis attempted, he couldn’t get Matt to believe. But by the time the show was finished, it didn’t matter whether Matt had any idea how any of the tricks worked. He was smiling. “The bottom line is that he had a wonderful time and so did the other kids,” Curtis said. “The birthday kid is the star of the show,” Curtis said. The birthday child is always called up during the show and, for the magician’s final act, is levitated on a seat. Curtis, a Morgan Hill resident, is the only magician catering to children in the Bay area. He does shows as far north as San Francisco and south as Gilroy. Curtis won the 2001 Reader’s Choice Award for Best Children’s Entertainer from Bay Area Parent Magazine, but the kids aren’t the only ones having fun during Curtis’ show. Parents also find themselves trying to figure out the magic and laughing at his jokes. “It’s wonderful that the people I do this for appreciate what I do,” said Curtis, who charges $225 for his one-hour magic act. Curtis first became involved in magic when he was a 10 year old living in Cupertino. After college, Curtis had to cut down on doing the magic act and began working at Toys R Us and later in the vending machine business. That opportunity came seven years ago, when Curtis decided he could take on the magic act full-time. Most of his shows are birthday parties for about 15 to 20 kids, but Curtis has done shows for as many as 1,000 kids or, in one special case, just one child. With the variation in the size and age of his audience, Curtis’ has to be ready to change up his show at any time. Curtis said his favorite age to perform for are the younger audiences. Curtis said in the future he hopes to do more shows at elementary schools, but, for the most part, doesn’t want to change a thing. He is enjoying every minute of bringing magic into kids’ lives. 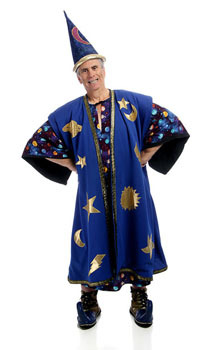 For more information about Lee Curtis’ act, call 778-5750 or visit www.magicalwizard.com.